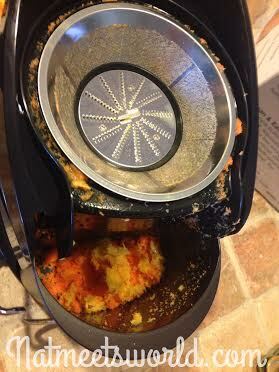 Cuisinart Juicer Makes Eating Veggies a Piece of Cake! Along with half of the U.S. population, one of my New Year’s resolutions is to lose weight. Every year I think of new ways to slim down, and when find something that works, I stick to it. One of the hardest things for me to do is eat fruits and vegetables. I hate the taste of 98% of them (crazy, I know….but that’s what happens when you’re raised on rice, beans, and sweet plantains as a kid). I find myself trying all sorts of diet plans that exclude fruits and veggies, but the reality is, you can’t exclude the vitamin packed foods that are beneficial to your health. One of my best friends (Hi Yani!) juices her fruits and veggies every morning, which gave me an idea. If I can’t eat them raw and whole, I’ll juice them and eat them that way! 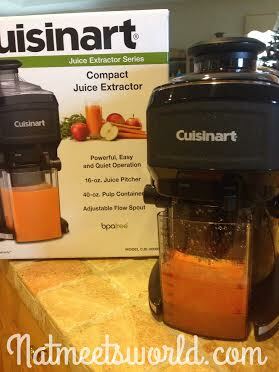 I hurried over to the mall and purchased the Cuisinart Compact Juice Extractor Model CJE-500BW. It’s compact size is very convenient and is unbelievably quiet! As soon as I pressed the simple on/off power button, I prepared myself for a loud blender type fiasco, but to my amazement, it quietly hummed as I inserted my fruit. 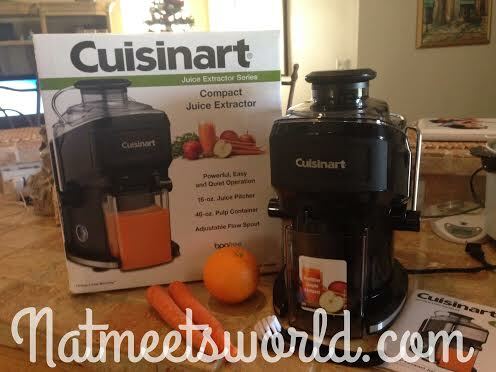 The Cuisinart juicer also includes a 16 oz. pitcher and a 40 oz. pulp container which allows for easy clean up. The adjustable spout also allows you to control the juice flow and smooth extraction, and its large feed tube reduces the prep and pre-cutting time of your fruits and veggies. For my first juicing experience, I used one whole orange and 4 fresh carrots. You can see (below) the scraps were easily collected in the pulp container . I must say, the juice had a pleasant consistency and I actually enjoyed it. Take it from someone who refuses to eat anything green or orange. I look forward to juicing in the new year and feeling energized for the day. Don’t feel like washing all of the parts when finished? No worries! The parts of the juicer are top rack dishwasher safe! Deal Alert: Purchase this item with in-store coupons and deals from Macy’s. It was honored for me and I saved almost $19.00! 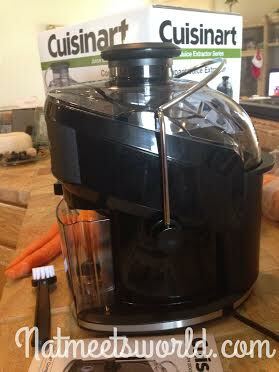 Disclosure: All comments, opinions, and experiences on the Cuisinart juicer are my own.